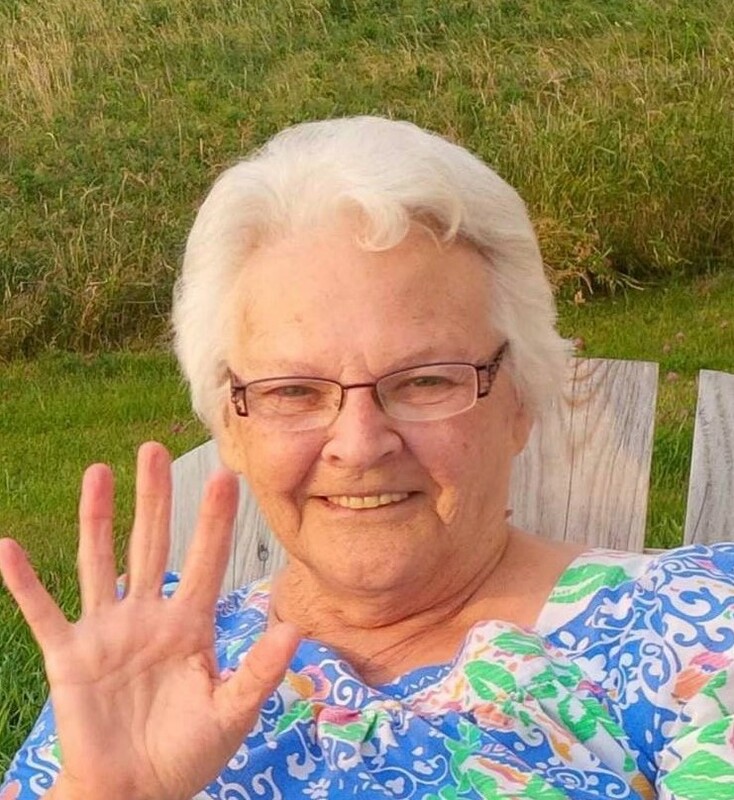 It is with heavy hearts that the family of Eileen Belliveau announces her passing at Foyer Père Fiset on December 19, 2018 at the age of 84.Eileen, (née LeBlanc), was greatly loved by her family and extended family and was well known for her devotion to the communities of St. Joseph du Moine and Grand Étang. Family lore has it that she was originally named Marie Rose Helene LeBlanc, but a relative, while she was an infant, suggested the name Eileen, which was the same name as another relative, and that was the name she adopted for life. Eileen was a teacher for more than 30 years. She is well remembered by former students for her sing-alongs on Friday afternoons where children gathered around her piano. She had a great passion for her job and was well respected by her colleagues at the schools where she taught. Eileen was known as “Maman” to many. She was a Hall of Fame wild strawberry picker for many years and a revered bread maker, able to whip up 10 or more glistening loaves of bread in no time without any measuring devices, all while keeping an eye on Wheel of Fortune or The Price is Right. The only sign of her whirlwind baking was a fair amount of flour on the kitchen counter and on her arms. She was also a world-class maker of chicken fricot, homemade beans, rolls and pies. A fast and nimble piano player, Eileen has entertained hundreds, if not thousands, over the years, in her classroom, or at halls accompanying Chester Delaney and Claude Aucoin. She was also the organist at the St. Joseph du Moine Church for about 50 years, which included playing in the original church, playing the very powerful pipe organ in the upper level of the church. Eileen loved being surrounded by family and laughter. Many evenings were spent playing cards at Bernie à William’s house where laughter was guaranteed. In the last years of her life, Eileen was comforted having her sisters by her side. She will be greatly missed by the surviving Golden Girls, Matante Zabeth and Matante Diane. She was predeceased by her husband, Edouard, in April 2017. She was also predeceased by her father, Moise Leblanc, and mother Luce-Agnes (Chiasson), sisters and best friends Therese (Murphy), Julia (Lester) and Marie-Hilda (Aucoin), and brothers Albert and Linus. She also greatly missed her furry friends, Libby, Leo and Pepper. Eileen is survived by her children; Alfred (Christine); Yvon (Nancy); Marc (Lori), Annette (Marcel) and Gilles (Mike); grandchildren Guy, Josée, and Anne LeLievre; Kendra Belliveau; Ian and Claire Belliveau; and Melanie, Elise Belliveau and April MacDonald; sisters Elizabeth (Chiasson) and Diane (Doucet). The family would like to thank all the staff at Foyer Père Fiset for their kindness and care over the years and their patience when visitors to Eileen were of the four-legged kind (Buddy, Boone, Cumagh and Millie). The family would also like to thank Doctors Marcel Aucoin and Amélie Maillet for their care and compassion. Visitation will be held on Saturday, December 22, 2018 from 9:30 until time of Funeral mass at 10:30am in St. Joseph’s Church, St. Joseph du Moine with Father Peter LeBlanc officiating. Eileen was a very giving person. Following in her footsteps, in lieu of flowers, the family would ask that you extend an act kindness to someone who is alone or less fortunate during the holiday season. So sorry for your loss. I send our family’s deepest sympathies to yours. She was a fantastic teacher and an even better human being. She will no doubt be missed by all who knew her. Our sincere sympathy to all the family of Eileen. SHe was a very special person..Sorry we are unable to atttend her funeral. Pauline & Brendan Campbelll. So sorry to hear of the passing of this wonderful woman. I spent most of my childhood hanging around with Annette and Gilles, and Eileen was always so kind and welcoming (even when I’m sure that we were being pests!) Will miss her smile, her laugh and the mouth watering aromas coming from her kitchen. Rest in peace Eileen. Sincere sympathies going out to the family. R.I.P. Eileen, you were such a special soul! I was never a student in her class, nevertheless Eileen defines my early years in school. Some of the songs from her sing alongs still play in my head, she brought such passion to those long ago performances. I am certain that we shall all enjoy her music once again once we pass through Saint Peter’s Gates. My sympathies to the family,Tante Eileen will be missed by many. Our sincere condolences to Yvon & siblings on the loss of your dear mother.